Project named El Jeffe after a dear friend is the most boss project we ever put together 6 bedrooms all identical with 6 bathrooms in suite. All bedrooms have AC, Wall Safe at least a queen bed Flat screen. The middle common area has a island that can accomodate the group 6 at a time to eat. huge distance to lleras no as can be national police on the corner. Back terrace has sofa frontplus a front terrace. Wifi throughout 10 megs. Manila area of poblado is home to forma gym, many many restaurants walking distance to metro and exito supermarket. ATM's are all right there on avenida Poblado. Taxi's come right to the house. Booking via this Platform. We will require a signed contact, A copy of front and back of the credit card used to book, Plus a copy of your passport or cedula. All have to match the original booking name. PLEASE SEE THIS due to huge amount of fraud we getting recently it has to be this way. I am one of the largest single Medellin investor together with my partners we make up one of the biggest groups of privately owned vacation properties in Medellin Period. I answer questions 7 days a week and at times feels like 24 hours a day. cheapest 6 bedroom apartment for daily rental in poblado with AC in bedrooms and all in suite bathrooms. all rooms have bathrooms, wifi is 10 meg, wall safes and AC and hot tub. Huge island to eat at. bring a blue tooth speaker. 4 person hot tub huge hot water heater. can set up driver for tours or airport. Barry, Santiago, and Camilo provided very good service wherever and whenever possible. Very good house location. 6 AC bedrooms with 6 bathrooms in each of them. Perfect place!! I just wanted to say thank you. I’m blown away by how wonderful reading this was. Come back anytime you want. I be honored. The apartment is huge with 6 bedrooms and baths. The neighborhood is quiet and one block from a police station. Very close to Barrio Colombia, Premium Plaza and Parque Lleras. I would recommend to any group. I highly recommend this apartment! My friends and I stayed in this beautiful apartment over the weekend. Wow! The apartment is very comfortable for a large group and located in a tranquil neighborhood, but more importantly the personal care is outstanding. Prior to our arrival I sent Barry an email; he responded immediately to my question. When we arrived I received another email checking to see if all was well and if we needed anything. Barry goes above and beyond to care for his guests. Excellent apartment, fantastic location, fantastic ammenities! Stay HERE! I stayed in this apartment last week with a few friends and I loved it. 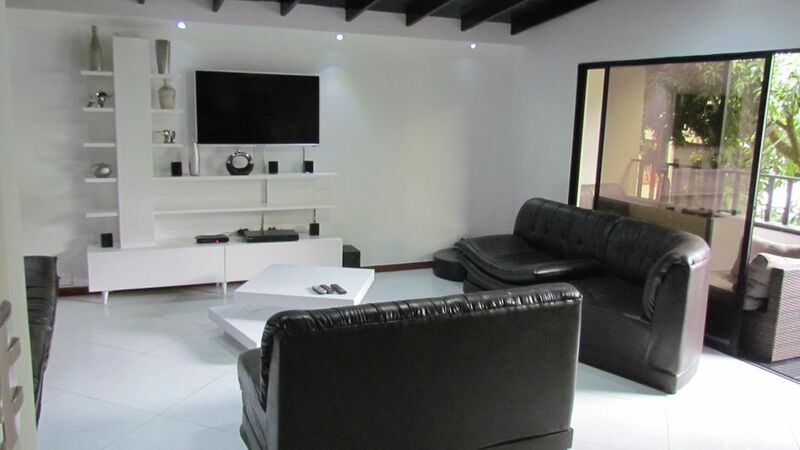 Barry and the team at Poblado Rentals have done a fantastic job remodeling this property. In the small enclave of Manila in Poblado Medellin. There are dozens of restaurants shops, supermarkets, and you are two blocks from Avenida Poblado and 15 walk or 5 min taxi ride to Parque lleras. Mateo is why we do what we do. Wonderful responsible people. I'm proud to have guys like him come stay with us. Thank you for taking the time to write this. Gym right down the street to left. Metro close by Exito a few blocks away like a kmart with groceries. Taxi's come right to house. Please behave here. National Police one block away. Nice family below.